Buy it for the castle, love it for the taxidermy. 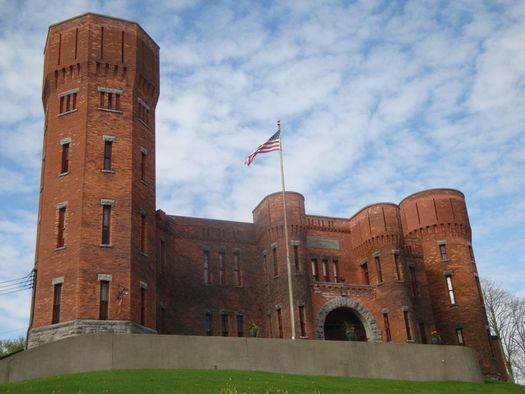 We heard today that the Amsterdam Castle -- which actually is a former armory, but looks like a castle -- finally sold. Soon-to-not-be-the-owner-any-longer Susan Phemister confirmed during a phone conversation. She says the new owners are "very nice people who plan to live in the castle and continue to run it as a bed and breakfast." The building is currently closed while the Phemisters move out and the new owners make some renovations. And now it's sold. Phemister couldn't disclose information about who bought the castle -- the new owners are "very private," she explained to us -- but she says she wishes them the best and hopes they can enjoy the good will and interesting experiences that come with owning a castle. So, what does one miss about living in a castle? Phemister says she'll miss "sunsets on the front moat, having a glass of wine and overlooking the beautiful Mohawk Valley." someone wanting to film a television show, or a movie about Benedict Arnold." Phemister says leaving the castle was a lifestyle choice designed to help focus on the education of their children. "Would I do something like this again? Sure -- when I have an empty nest. I don't know if I'd do a castle, but maybe a church? It's been a wonderful experience and I wish the new owners the same." Another dream, crushed. Komradebob will be happy that he won't have to hear me sigh about it now.